What do you get when you mix the art world, unimaginable wealth, a missing girl, gentrification, greed, politics, corruption, one head-strong guy named Reddick and a dash of misdirection? 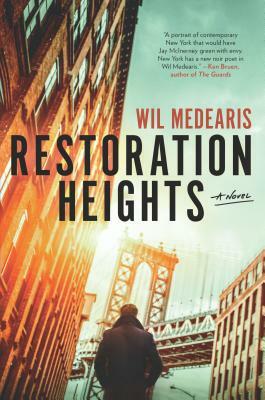 You get Wil Medearis’s outstanding debut novel Restoration Heights. Contemporary New York City noir at its best! "Noirish...compelling...innovative." --New York Times Book Review "A big-bang debut." --Library JournalA debut novel about a young artist, a missing woman, and the tendrils of wealth and power that link the art scene in Brooklyn to Manhattan's elite, for fans of Jonathan Lethem and Richard PriceReddick, a young, white artist, lives in Bedford-Stuyvesant, a historically black Brooklyn neighborhood besieged by gentrification. He makes rent as an art handler, hanging expensive works for Manhattan's one percent, and spends his free time playing basketball at the local Y rather than putting energy into his stagnating career. He is also the last person to see Hannah before she disappears.When Hannah's fianc , scion to an old-money Upper East Side family, refuses to call the police, Reddick sets out to learn for himself what happened to her. The search gives him a sense of purpose, pulling him through a dramatic cross section of the city he never knew existed. The truth of Hannah's fate is buried at the heart of a many-layered mystery that, in its unraveling, shakes Reddick's convictions and lays bare the complicated machinations of money and power that connect the magisterial town houses of the Upper East Side to the unassuming brownstones of Bed-Stuy. Restoration Heights is both a page-turning mystery and an in-depth study of the psychological fallout and deep racial tensions that result from economic inequality and unrestricted urban development. In lyrical, addictive prose, Wil Medearis asks the question: In a city that prides itself on its diversity and inclusivity, who has the final say over the future? Is it long-standing residents, recent transplants or whoever happens to have the most money? Timely, thought-provoking and sweeping in vision, Restoration Heights is an exhilarating new entry in the canon of great Brooklyn novels.